High on our agenda for our Florida trip was a visit to Blue Springs, a bit west of Orlando. This is a classic limestone (karst) spring, carved out by upwellings of sweet water. We devoted our last morning to it, as a sweet cherry atop the luscious sundae Sunday of our trip. 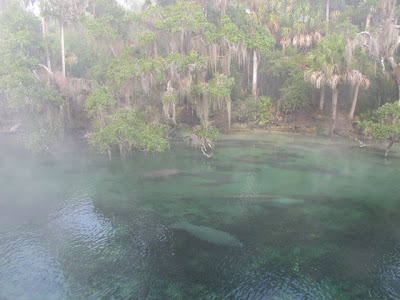 It was cold and foggy when we arrived, making us envy the manatees stacked like cordwood in the pellucid 72 degree water of the river. My first wild manatees, anywhere. Yes, I'd seen the Amazonian freshwater manatee in Brazil and Guyana, but only in captive situations. Heck, I'd gotten right down and hugged them! I was overwhelmed by seeing free-living wild manatees--so very many--I counted 80 in one turn of my head! Yeah, yeah, I was bawling. 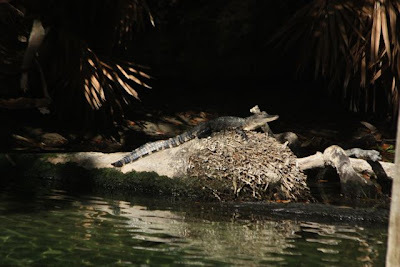 I'd waited a long time to see my first wild sirenians, and I'd strained my eyes peering into the muddy waters of many a tropical river trying. This was too easy. It was like they were waiting for a bus, and the bus was us! While we waited for the fog to clear, we looked beneath the observation dock. 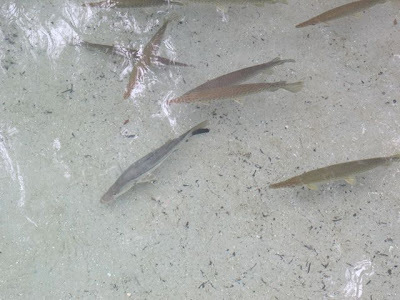 Some native Florida gar joined a snook, hanging as if on strings in the water. My GarGuru, FloridaCracker, advises that there may be two species of gar here, so he advised me to go against my Science Chimp instincts and not get too specific. The spring was almost choked with tilapia, an African escapee from fish farms. They're cichlids, related to those darlings of freshwater aquaria. Pretty good eating, but it doesn't look like we're going to catch up with their reproductive rate any time soon. Sigh. 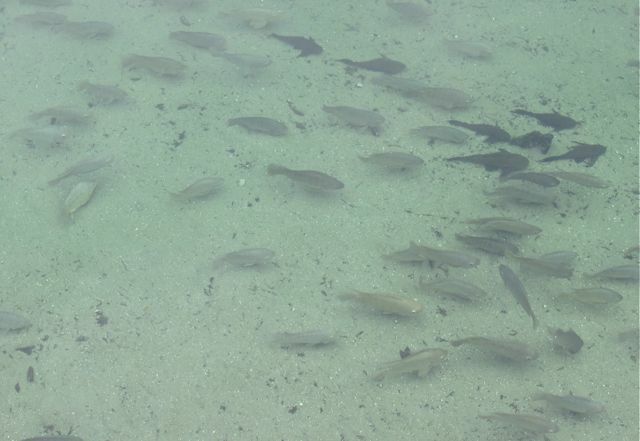 Fortunately (or unfortunately for Blue Springs), tilapia are confined to waters that stay above 60 degrees year-round, meaning that (so far) only Florida has to deal with them, and, outside of extreme southern Florida, generally around power plant outflows. interestingly enough, commercially farmed tilapia are subjected to testosterone baths as young fry, turning them all into males. In this way, pisciculturists can ensure they raise an even-age batch of harvest-sized fish, rather than having to sort the offspring of their inevitable pairings. These look pretty even-aged to me--where are the juveniles? Dunno. FloridaCracker says tilapia make huge, meter-wide bowl-shaped nests, crowding out native sunfishes. Bah. Why do so many escaped exotics have to live so darn large? Tilapia have made it to the International Union for the Conservation of Nature's 100 World's Worst Alien Invasive Species, having been introduced into tropical waters all over the planet. They're the big boxy gray fish in this photo. The blackish banjo-shaped catfish are vermiculated sailfin catfish, native to Amazonia and known in the aquarium trade as Plecostomus catfish, or "plecos." One guess where those came from. I'll give you a hint. When I was a kid, I had one in my tiny 5 gallon aquarium along with the mollies and platies, and it got about 8" long so we gave it to the neighbors, who flushed it down their toilet when it got too big for their 20-gallon tank. Never give anything to your neighbors if you care about it. In an Amazonian fish market in Manaus, Brazil, I saw Plecostomus catfish for sale, stacked like firewood, upside down, their sucker mouths gasping for air. They were about a yard long. I felt bad about that for years until I saw these. Why do we import things like this, to put in little tanks and then, when they no longer fit in the tanks, to put in our crystal springs, where they dig the sides out and erode them, making their nests? Why do people keep Burmese pythons and then, when they're too big for the apartment, turn them loose in the Everglades, to proliferate to terrifying levels? That's just what we do. Dumb stuff like that. Genies get out of bottles and there is no stuffing them back. Especially when the genies like Florida's subtropical climate. 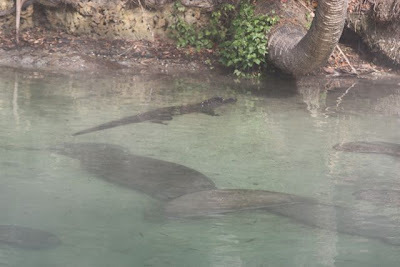 There were other creatures in with the manatees, which caused the big sirenians no concern whatsoever. This was the youngest gator we saw, still carrying its banded tail. It was about two feet long. Even the big gator seemed not to carry a threat to the gentle mammals, who cruised right under it. Blue Springs State Park is a magical place. 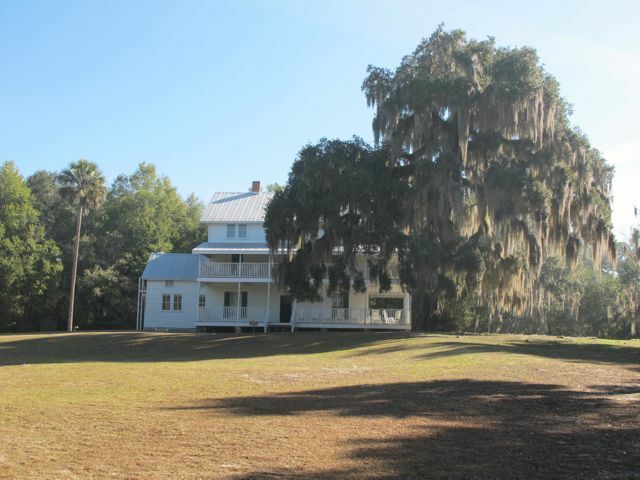 Just the original homestead with the new sun beaming through its Tillandsia-draped tree...oh my goodness. We didn't have time for the house tour. Well, anyway, the Science Chimp can rarely be found on historic house tours--she's usually digging around in the leaf litter instead. We had only one morning, this misty morning burning off to bright sun, before we had to go back to freezing, iron-gray Ohio. We soaked it up as best we could. More manatees anon! Luckily my husband catches our fish, crappie, walleye, bass, trout..they are not corn fed. The big corn agra businesses are foisting more and more corn on the public where we don't need it. I agree the Manatee at Blue Springs is not to be missed. I have raised tilapia at home for food, as you might raise a home chicken flock for meat and I had never heard that cornfed/fat fact before. Interesting ... pity the poor corn plant, soon it's reputation may drop to the level of the public school teacher ... all evil and such. The nice thing about tilapia raising is that they are efficient filter feeders too. Keep the water green and feeding is only a supplementary activity. It is a fish I love in captivity or on the plate , while hating it as an exotic. Tilapia are mouthbrooders, so the very young juveniles could easily have been hanging out in Dad's mouth. If I were a slightly older juvenile, too big to duck back into Dad's mouth, I would be hiding in the exotic hydrilla weed, trying to avoid gar and bass. You really hit Blue Springs on a stellar day ... I have never seen that many manatees at one time. Once again, the lady from Ohio shows the way here in Florida. Ohio will never be all iron-gray with that beautifully flaming red head in residence! I like that Phoebe, having been there last year, acted as your guide on this year's visit. You make me fall in love with my home state all over again. I think Visit Florida should be paying you for these posts! If the Science Chimp dug around in the leaf litter at Blue Springs, you would probably find evidence of Florida's earliest human inhabitants. The American homestead sits atop/adjacent to Thursby Mound, a major Native American ceremonial site. 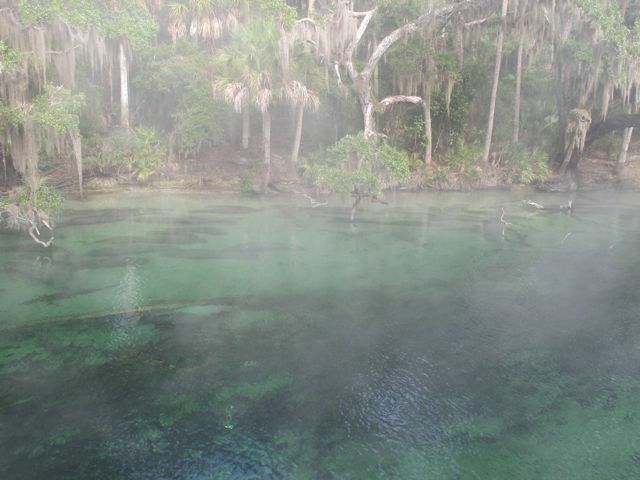 The beauty and bounty of Florida's springs have always been appreciated (and exploited0 by people. What's ironic in Hawaii is that they're known for living in really polluted, nasty water, so no one wants to eat them. Aquaculturists have taken to putting food color in their feed to turn them yellow, and marketing them as "golden tilapia." It hasn't worked all that well. I wanna go!! I wanna go!! I wanna go!! A definite must-see next time we're in the Sunshine State. Thanks for the travel tip! 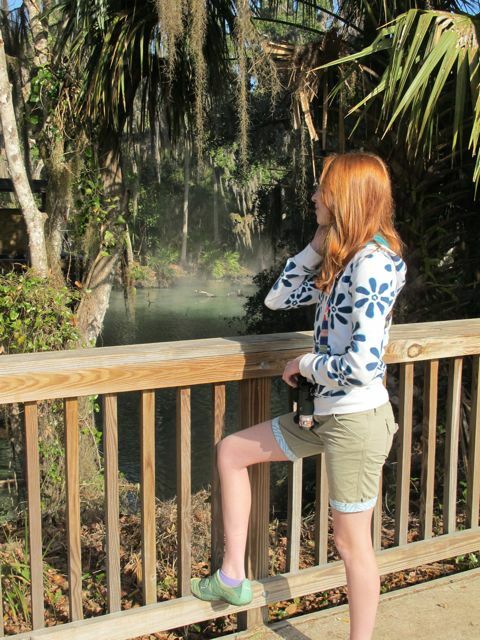 I really, really miss north Florida's springs. They are among my favorite places on earth. My sister & I visited Blue Springs about 15 years ago in February & fell in love with the manatees we saw there. They move so slowly, and yet they seem so graceful. While there I got a chance to also see several Blue-gray Gnatcatchers flitting around the bushes near the spring. 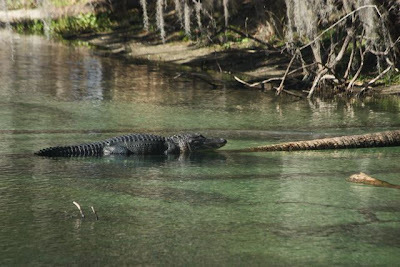 I was highly amused to pass by a roped-off swimming area in the river with a "Beware of Alligators" sign not 100' away from it!